Sometimes you might have a good compressor, but find the front shaft seal leaking. You can opt for a new or reman compressor, or if you have any mechanical ability, or just like fixing your own car, changing the shaft seal may be the better answer.. Below is a step by step procedure along with the Mastercool part numbers for the tools youÃ¢ÂÂll need. 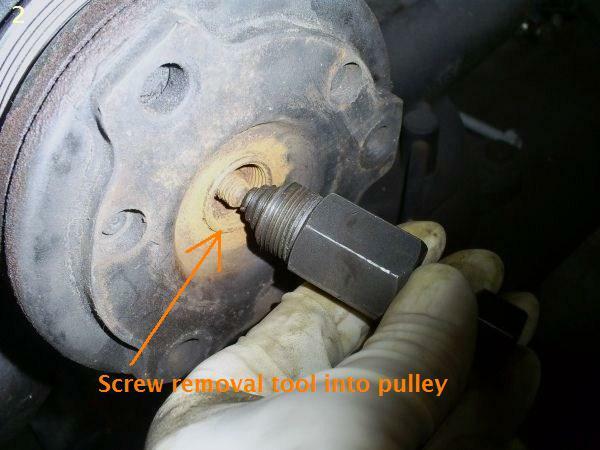 Before starting, you will have to clean the threads on the pulley and shaft so that the tools will screw on properly. If you donÃ¢ÂÂt Ã¢ÂÂgrabÃ¢ÂÂ enough threads, you can damage them. Some WD40 and a pick to clean the grooves helps.. Remember when changing front shaft seals that you MUST keep the surfaces clean, and itÃ¢ÂÂs recommended you clean the inside of the Ã¢ÂÂnoseÃ¢ÂÂ before you pull the seal out. A can of aerosol brake parts cleaner is great for removing oil and dirt from the nose after the front hub is removed.. When assembling, use plenty of mineral oil to coat the shaft and the seal. It will make installation much easier. Some seals can be replaced on the car, with no need to remove the compressor. You will need to check the space you have to work before making that decision, but it always easier to do them on the bench..
Once the nut is removed, screw the clutch plate removal tool (Big nut screws into the pulley) into the threaded pulley, and then remove it by turning the smaller nut on the tool clockwise. The Ã¢ÂÂkeyÃ¢ÂÂ usually comes off with the clutch hub, be sure you donÃ¢ÂÂt lose it..
Once everything is clean, use the internal snap ring pliers and pull out the snap ring holding the seal in place. Sometimes an awl can be used, but will damage the old snap ring. So plan on replacing it..
Use the seal removal tool and bottom it out on the indentation on the seal, twist the tool til it grabs the seal, and with a twisting motion turn, and pull outwards until the seal comes out. Next, using a pick, grab the O ring in the groove around the seal (where it was) and pull that out. Use a new o ring when you install the seal The pic shown of the seal is JUST the seal, but the guys at Ackits.com can get the whole kit for you. Seal, snap ring and O ring in one seal kit. Just e-mail them at [email protected] for prices, and give them the seal number shown in the picture..
Now that the seal is in place, you need to install the snap ring. Make sure it seats in itÃ¢ÂÂs groove correctly (beveled edge out) Check it twice.. You hear of guys changing seals and them blowing out. Usually due to improper installation of the snap ring Once itÃ¢ÂÂs in, replace the pulley (if removed) and then locate the key in the shaft about half way into itÃ¢ÂÂs slot. Use the clutch plate installer tools to push the plate on, be sure the key is properly lined up. Press the plate on until you have a gap of about .02 If you donÃ¢ÂÂt have a feeler gauge, you can use a business card. It should fit snugly all around the air gap. Put the compressor back on the car (if it was removed) and pull a deep vacuum and charge the sticker amount back into the system. Retrofitted cars you can follow the vac/charge procedures listed on the FAQ and tips page of this forum. Little information from our remanufacture. All their A6 compressors come with the double lip seal. Any play in the compressor shaft will damage the seals and cause leaks. They said you may get away if a small amount of play with a ceramic carbon seal. We just pulled the hubs off both our vendors remanufactured and ALMA new A6. As you can see in these images the one on the left has a ceramic seal and the one on the right a double lip seal. I have also confirmed that our you will need two different double lip seals depending on the compressor shaft. MT2105 Ã¢ÂÂ MC-556DN measured the top of the can the ID is 15mm If a shaft is 14-15mm then you would use this seal. Anything larger you would use the MC-1148. You cannot use the SK-771N (MC-1148) on all shafts. It is too big and it will not seal. Mickey said that he measures the ID on the inside where the Teflon is. MC-1148 Ã¢ÂÂ If the seal is OE it will have the GM number 6560844 stamped on the top of the can. This seal is mostly used for the late model HT/HU compressors. MT2105 Standard Shaft "Top of can 15mm"
MT2230 Large Shaft "Top of can 18.25mm"